In July I took my little family and we headed West to spend time with my siblings. We had a great time camping, visiting, and swimming. It was a great week of reconnecting. 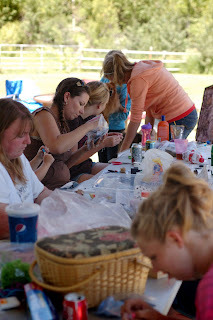 However, the highlight for me was introducing my family to one of my loves - jewelry making. 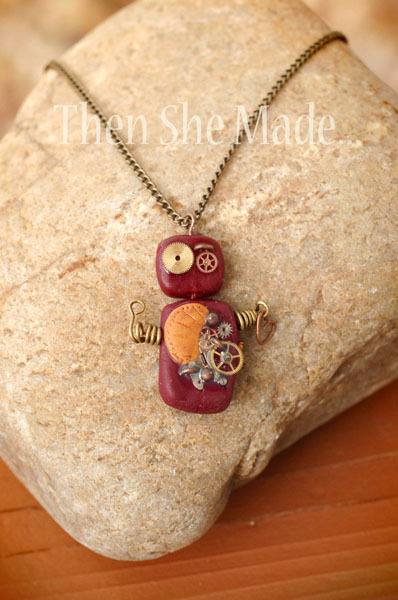 It all came about because my cute niece saw a camera necklace that she loved but it was WAY expensive and I casually said - "hey, you could make that!". So, I packed up some of my gear and one morning at camp she and I sat down to create. It didn't take long before lots of others joined in. Really, who can resist some crafty goodness?! Even my brother made some too - awesome! Anyway, after we got home I left all the jewelry supplies out and I've been having lots of fun. I love it because it's something my girls like to do too. In fact, a couple of nights ago my teen said, "I'm glad I have a crafty mom. I wouldn't get to do this otherwise!" Sweet! Points for me! All of these creations were made from clay, paint, stamps, and some hardware. 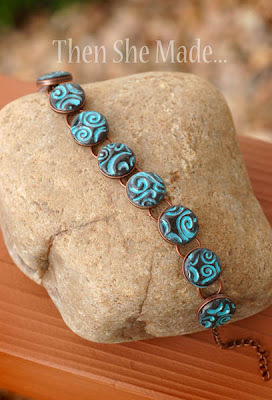 Some other day I'll have to show my regular bead work creations. I'm addicted to those too! 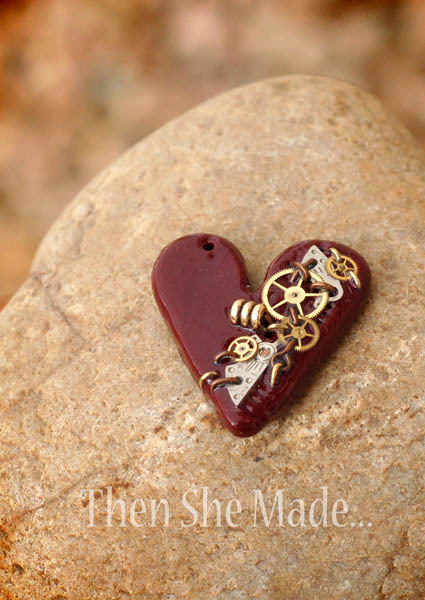 I also tried my hand at a little Steampunk - love the gears! The robot doesn't have a name yet. Any suggestions? Fredrick? Frank? I haven't put it on a chain yet, but I will. And, last but not least, here's my camera pendant. Alison wanted to make a camera, hers was so cute I wanted to make one too. Fun, Right?! I'm very addicted. If any of these creations fit your fancy, let me know, I'll do a tutorial! Really cool - next visit we should try "my" hand at that. These are beautiful! Very nice job and very creative! I love that robot. These are great! 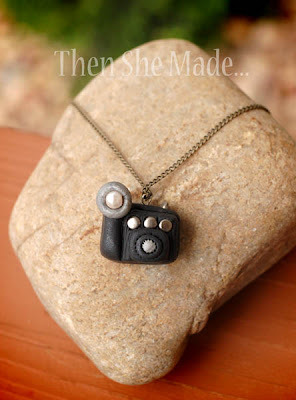 Love the camera pendant! They all turned out adorable the heart is my favorite! They are great! I would like a tutorial for all of them but for the young womens values would be great. You are amazing! Can I vote for tutorial of all of them? They are fabulous! 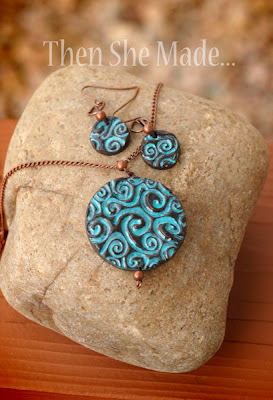 Love the Values necklaces....would love to see a tutorial on it. I have never really used clay for any projects...so need to know what kind...do you bake it...how do you put on the design...everything!! Would love to make these with the Grand daughters! Love these! 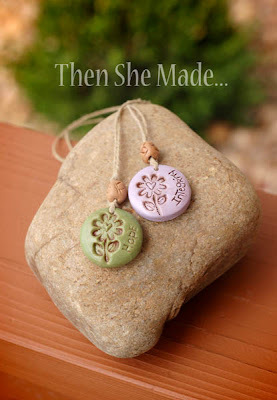 I would love to know how you make them, especially the word pendants. Love all of your sweet little scultpy creations, especially the heart with the little pieces in it. adorable! I would love to know how you get the metals to stay put. Tutorials would be great. Can't wait to try them! Oh My gosh!! Triple love all the jewelry. The camera made me squeal! Haha. Please give tutorials on all of them! I love that little robot! So stinking cute! I've just stumbled upon your blog and love it! Love the steampunk! Awesome work. I luv steampunk! How about "Fritz"patrick ? !